Anglesing! is a residential singing weekend at Bodewran Bach Campsite on the beautiful island of Anglesey in North Wales. 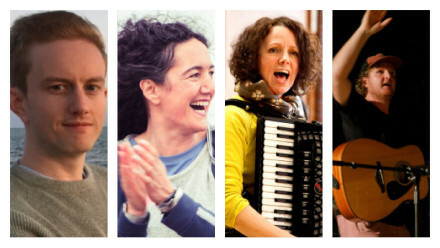 Led by vocal leaders James Sills, Roxane Smith, Jamie Dawes-Hughes and Mary Keith, you will learn a range of harmony songs from around the world. Emphasis will be on fun, enjoyment and experiencing community through joyful singing. You can also take advantage of the onsite pub, yoga sessions and campfires in the evenings. Fresh and tasty local food will be provided at lunch and evenings, with breakfast available to buy onsite. All are welcome. Children must be accompanied by at least one adult. Your own tent / caravan / campervan / motorhome; breakfast items (if not purchasing onsite); cash for onsite pub; camping chair; warm clothes; instruments for cabaret. James, Roxane, Jamie and Mary are experienced vocal leaders and run choirs across North Wales, Cheshire, Merseyside & Shropshire. They believe that singing is everyone’s birthright, regardless of musical experience or ability. No previous experience or music reading ability is required: all of the tutors will teach by ear - everyone is welcome and no-one will get left behind. Over the weekend, there will be several 'Big Sings' in the main marquee led by all four tutors as well as individually led elective sessions. In addition to a Saturday night cabaret, there will be an informal sharing concert on Sunday. The event will go ahead whatever the weather. All of the singing sessions will take place inside, either in the big marquee or other areas of the site. Places are limited - to secure your place on the weekend, click on 'Buy Tickets'. Please complete the questions regarding dietary requirements for each person on the booking to help us assist with catering. Thank you! Further information, such as final schedule and directions, will be emailed you closer to the event.